Our first day of diving dawned with the ever present 15 knot wind whistling. A fine day for sailing I mused, but it's sure going to be a rock and roll ride to the dive sites. 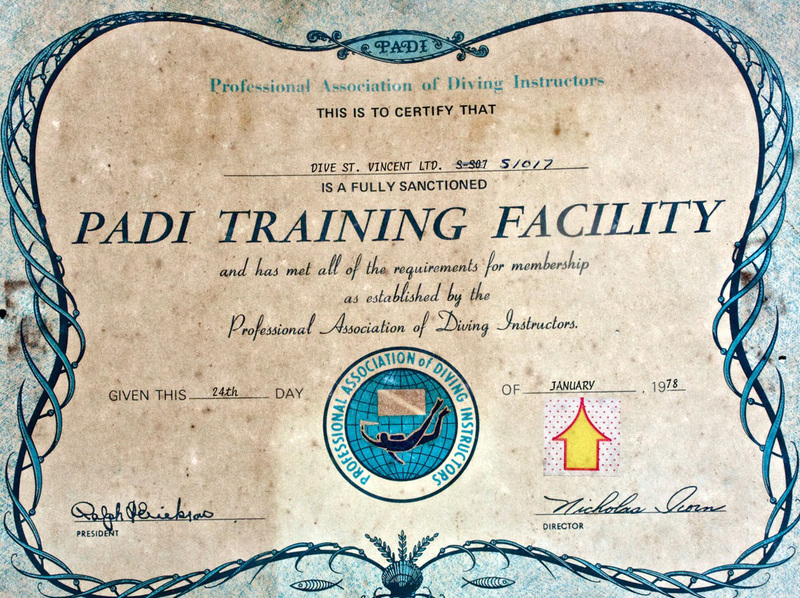 Tewes ran his NAUI/PADI affiliated operation for 30 years until his retirement in 2013. Bill has trained his staff well and his shop continues in capable hands both in and out of the water. Dive St. Vincent's two dive boats Dive St.Vincent two dive boats are moored at the end of the pier. SUNFISH..28' semi-cabin with twin 200s, and QUILFIN..32' speedboat with twin 250's and a hard sun cover. Craggy volcanic cliffs dropped from dizzying heights of several hundred feet straight into the sea, and then plummet on down into the abyss. The scenery is dramatic and abrupt. The black lava beach is evidence of the last eruption in 1979 of Mt. Soulfriere. Fast moving clouds scud across the 4,000 foot jagged peaks which descend into a rain forest and then bottom out on the dark gold and black sand beaches. The "Coral Castle" dive site was our first stop. 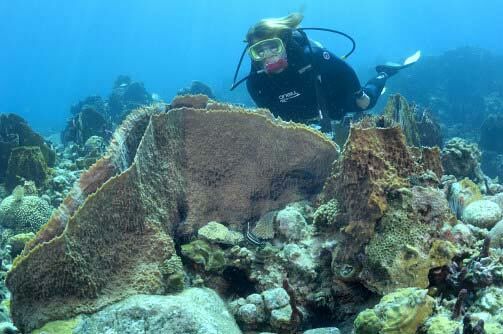 Only about 20 yards from shore, the drop off is formed by terraced hard corals. This seems to be the local headquarters for sea horses, cave, yellow cheek, three line, peppermint and other basletts. 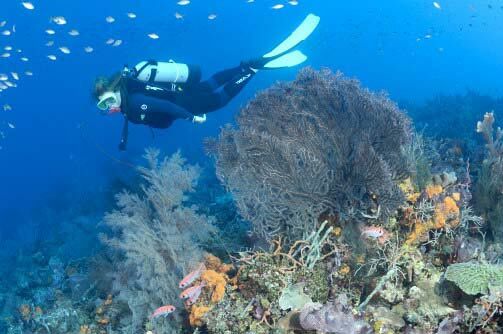 Many other critters make this home as well.The massive layering of corals looked sculpted, and it was adorned with gorgonians and sponges, completing the designed effect. The reef dropped away at about 75 degree angle to a sand void at about 125 feet. There was an abundance of small tropicals, but no large fish. "You'll see a shark if you bring your own," Bill quips. The dive team had repeatedly told us to expect a different type of reef at each location, so we were eagerly anticipating our next dive at "Turtle Bay." This dive site certainly bore little resemblance to "Coral Castle." Huge pieces of volcanic rock had tumbled from the cliff above and had become the basis for the encrusting reef. Large fields of yellow tube sponges covered the rocks, creating a bright backdrop for wrasses, damsels, many other reef fish, plus many types of critters. Nope, no turtles! At the North tip of the island the seas became confused and the wind approached 40 knots. We made a stern-first landing amidst this maelstrom onto a rapidly disappearing beach. Steep side cliffs enclosed a stream rushing to meet the sea. A 10 minute hike through this fascinating jungle canyon ended in a splendid view of the Falls of Baleine. Wind gusts bent the palm fronds at the top of the ridge, and a cascade of sparkling water tumbled 60 feet into a shimmering green pool. Don't miss a chance to swim in this wonderfully refreshing rock pool. It's an exhilarating dip beneath the thundering waterfall, amidst a tropical paradise that rivals any movie set you've seen. Our second day, we again had a fast, smooth ride in the comfortable 30 foot boat up the leeward coast. One of the most unique dives I have ever undertaken is the "Bat Cave" site. Our amiable divemaster/boat captain, assured us that the bats wouldn't bother us. "They'll be following us around the cave with the mini bat scuba gear on," he joked. Uncertain as to what to expect, we followed the divemaster through a shallow rocky passageway cut through the reef that led into a cave chamber inside the cliff. Lifting my head into the eerie half-light, I heard the screeching of bats and glimpsed them swooping. We then continued on the tour which lead through the cave to the opposite side where w narrow, deep fissure exit to the reef. Hordes of copper sweepers lazily meandered about the passageway, almost obscuring the view towards the reef. Outside, the sub sea terrain dropped rapidly, and at about 100 feet, we spied some lovely stands of black coral in shades of hot pink and red! The variety and species of black coral here was astounding. There are bush, whip and fern species with a profusion of intense colors. 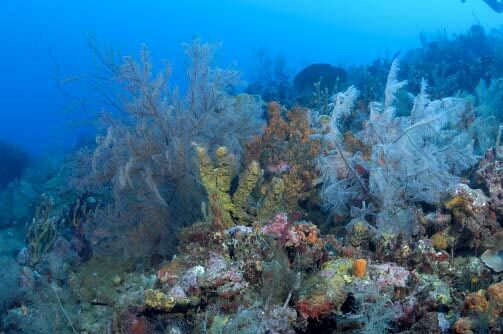 Nowhere was this more exemplary than the "New Guinea Reef," the showcase of St. Vincent's underwater topography. Bill Tewes named it because of it's resemblance to a South Pacific reef where he formerly had a dive operation. Massive cliffs protrude into open sea, and beneath them, the undersea extension has a lushness that rivals the topside verdant flora. The wall is full of black corals in various forms and colors. Gorgonians are huge and lacy, interspersed with barrel and vase sponges. A steady stream of chromis and creole wrasse give this gorgeous scene vitality. "Bottle Reef" is another unique site just below the cliff where Fort Charlotte stands. There is an interesting collection of rum and gin bottles that were discarded from the fort above. The wall slopes sharply just past this bottle graveyard. 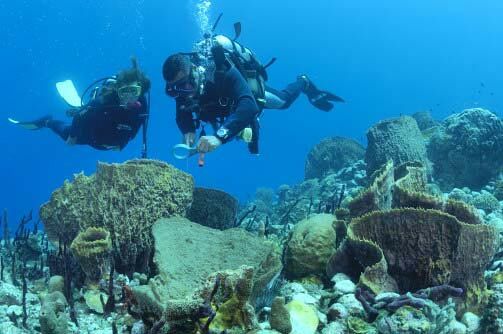 There are numerous other sites visited by Dive St. Vincent such as the Seimstrand, a 120 foot coastal freighter, and the remnants of an ancient wreck nearby. 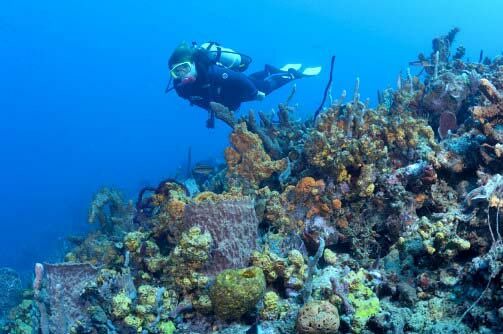 In recent years, St.Vincent has become very well known for its amazing collection of known and unknown fish and critters underwater. World class u/w photographers are coming here for the photographs they don't have, and to upgrade the ones they do have. EVERYONE will see something they have never seen underwater before they leave. It is a photography club's Mecca. Many photographers have come down and go home with prize winning photographs.